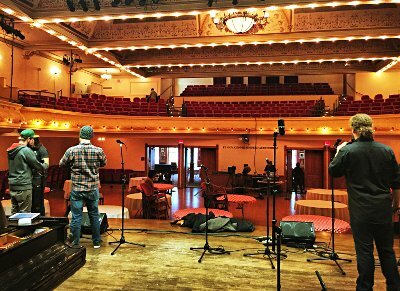 For NMC Audio Technology students, Picnic at the Opera House is anything but. 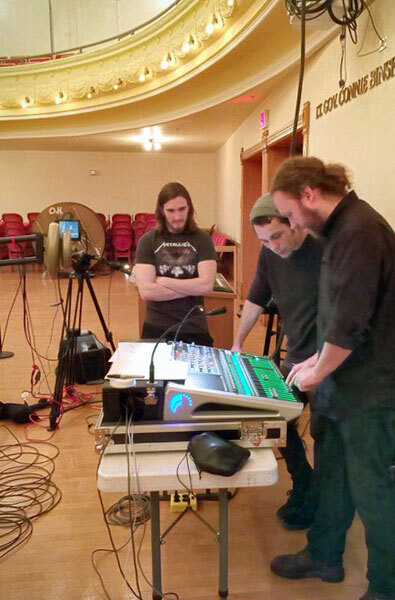 Under the direction of instructor Jonah Powell (right, foreground), 20-some students are responsible for all set-up and tear-down, changing the stage between each of the seven acts and mixing audio for both live and television audiences. “Audio is one of the more critical parts. It’s got to work on TV and it’s got to work in the house,” said Matt Cowall, communications director at the UpNorth Media Center, which broadcasts the free, live show that started its sixth season run today. That pressure means Picnic, performed each Wednesday in February, offers an ideal experiential learning, or EL, setting. With spring semester now in full swing, audio technology students are among many at NMC gaining from EL, defined as experiences where learning is deepened and enhanced through direct application of knowledge, both in and out of the classroom. Leaders of a project to expand EL at NMC estimate at least half of students have one experiential class, and are striving to increase that. It’s a natural fit for classes like Audio Tech. “We have to make an effort to make it like a classroom,” Powell joked of the program. Picnic’s four-week run also fulfills the EL requirement of reflection on the experience in order to improve it the next time. “It allows students the opportunity to tweak something and try it again the next week,” said Kristi Dockter, marketing director at the Opera House. Classes traditionally taught via lecture and textbook are also working to incorporate EL in order to capitalize on research showing it deepens learning, student engagement, and persistence toward educational goals. Check out NMC students’ talents as Picnic continues Feb. 14, 21 and 28, from noon–1 p.m. at the City Opera House. Cowall added that the students have enhanced the live side of the event in particular. Visual Communications – Graphic design students are paired with “clients” — area non-profits including Traverse City Parks and Recreation, the Grand Traverse Lighthouse Shipwreck Exhibit and the Benzie Historical Museum — and complete pro bono design projects. The class has been structured that way for about 10 years. Business – Students in Professional Communications will organize and host the fourth annual Big Little Hero Race to benefit Big Brothers Big Sisters on April 14. The event was just voted “Favorite Local Race” for 2017 by the Traverse City Track Club.